Yes, kittens, I will continue to track yardage in 2011. The year is off to a decent start. I had an unofficial, unambitious goal of knitting 1,000yds in January. I managed to meet it and exceed it by 70yds. Considering all of the sewing, baking, and other things going on here, that’s not too shabby. True, it’s low for me (my average month seems to be about 1400yds), but it’s not so low that I feel like I got nothing done. I think 1,000yds a month may be my goal post for every month in 2011. Once I start crocheting again, that number will be blasted out of the water. For months where I’m only knitting, it’s enough to move on projects while still doing other things I enjoy. I’m not sure if this is that “balance” thing I’m striving for, but it seems to be closer. It’s felt nice to be able to work on different things, and I’m even starting to work reading back into the rotation. I definitely haven’t been stressed out about knitting at all this month; that may be a first in a long time. This is for one of the WIPs I teased you with yesterday. In our home, the vote is now at 2-to-1, with The Boy agreeing with me which direction to take his blanket. Have I even blogged about it? Well, you may recognize that bright yellow-green. The rest of the palette has been picked out, but the question is which blue to use? 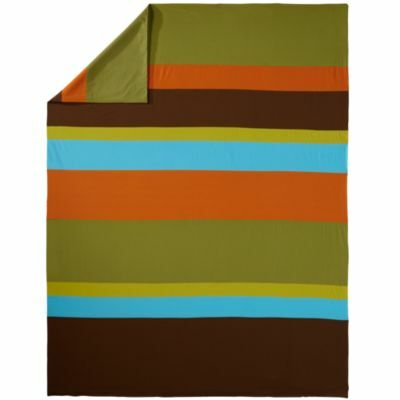 Here is the inspiration blanket from Land of Nod. Berroco Vintage (which I’m using) has colors that match up really well with the greens, brown, and orange, but none of the blues are quite the same as the one in the bed spread. If this were your blanket kitten, which blue would you choose? Ooh, see that, kittens? I barely get a knitting post out and BAM! 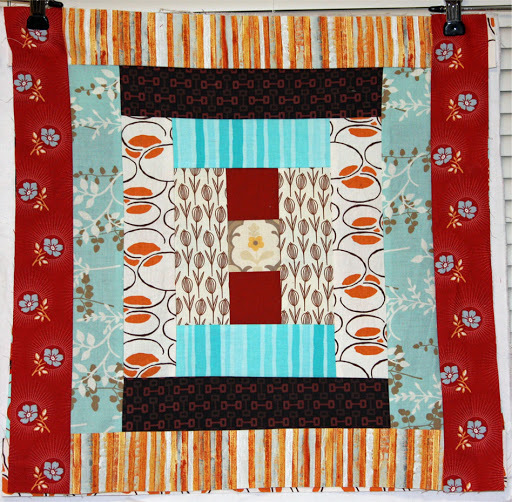 Quilting posts again. I’m tricksy like that. This is block 06 of 27. Now that I have a much stronger sense of direction for the colors, these are getting easier to piece, and I’m enjoying the process more. 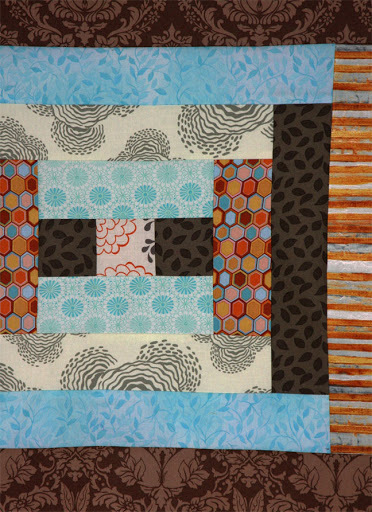 I finished this one last night and then proceeded onto a new project…Block 02, revisited. and I was very unhappy with it. 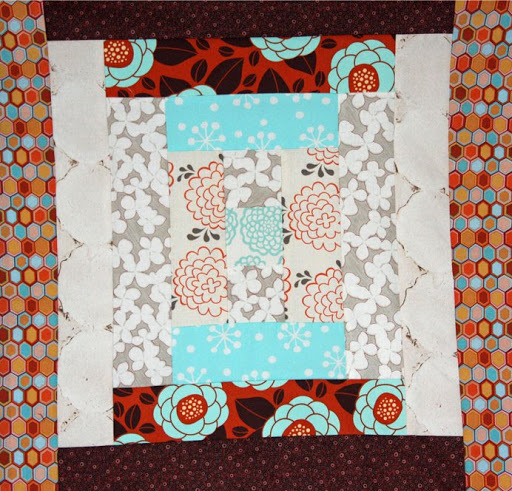 When I first dreamt up this quilt, I wanted to use a very slightly green-blue with bright red. And for some reason, that idea never left me. I washed up my red and green-blue fabrics, cut a couple, and tried to work them into this quilt. You gotta keep ’em separated. For real. These colors did not mix nicely and fought for the block. Sections went nicely together, but that was as good as it got. This one was the worst offender of the two I was going to just “chuck.” And by chuck, I mean use for something else. I didn’t want to lose the segments that I liked, but trying to figure out how to deal with them was giving me a headache. 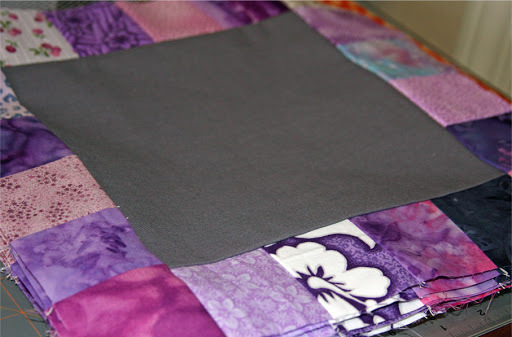 Because you see, kittens, I suffer from this chronic condition called, “laziness.” Anytime a project requires a lot of tedious picking out and repinning of seams–or you know, pinning them in the first place–I tend to scoff at the idea and drop it. I hate losing work I’ve already done. I have started to take baby steps in the right direction. This last week I’ve been seen ripping out a seam here or there and redoing it…or taking extra care to pin pieces together and ensure they won’t be moving while I sew. But redo a whole block? That’s just crazy talk. grafted new pieces on top of the old? 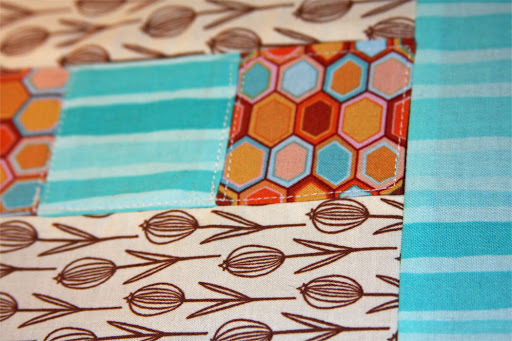 And sewed them along the lines I’ll later use to quilt the block?! This is either genius, or a whole new level of avoidance and laziness. I’m not sure which yet. Regardless, it worked after some fussiness, and I decided to make over the other two strips that weren’t jiving with the way I wanted these blocks to look. The whole thing was complete. I’ll be honest: this still isn’t my favorite block of the ones I’ve completed. But it is so. much. better. then it was before I made the fixes to it. Block 03 will also be getting a minor face lift after I decide what fabric to graft on. I think it should be OK with replacing just the middle square. I’ll end up blogging this one in more detail in the near future. As you can see, kittens, there’s a provisional cast on…and a lot of garter stitch. 95″ worth of garter stitch, if my math isn’t telling dirty lies. Once this bit is knit, I’ll have my yardage numbers to run with and get the other colors ordered. This one isn’t the easiest to make out. Dark tweedy goodness is hiding the shaping I’m putting in. This is a test knit for fallmasche on Ravelry. 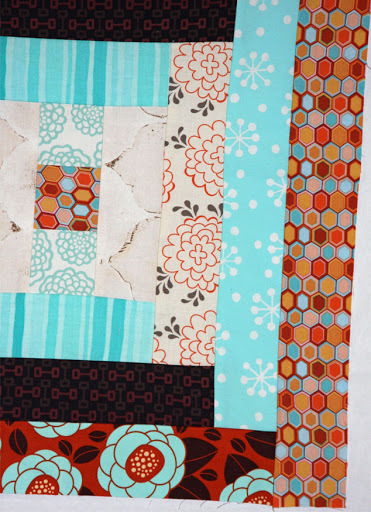 Kittens, I hope to finish piecing the blocks for the top of this quilt before I start piecing for an e-course I’m taking in February and March. The Mister will be off doing some unpleasant training during that time, so I figured it would be best to keep myself as busy as possible; I hate having too many WIPs at the same time though. Kittens, there hasn’t been a ton of crafting going on this week. However, I did manage to sew one more block of our bed quilt (04 of 27 needed unless I can find another “cheat” block or 3), and I did manage to piece together the other 11 blocks that will be embroidered during my Block of the Month project. They aren’t really all that interesting though. I pieced every one of them exactly the same so I could do faster, chain piecing. It took less then 3 hours to finish and press them all. For the most part, they’re nice and neat. Minus 2 perfect ones, they’re all slightly off (2-3 corners match up, but the other 1-2 don’t), but I was expecting that. Most of this fabric was bought ages ago from Jo-Anns or other cheapy places. So it has a lower thread count and doesn’t hold shape very nicely. I’m just hoping they won’t unravel and pop seams like our “Frankenquilt.” Kittens, in all things the quality of your materials really does matter. Just sayin’. 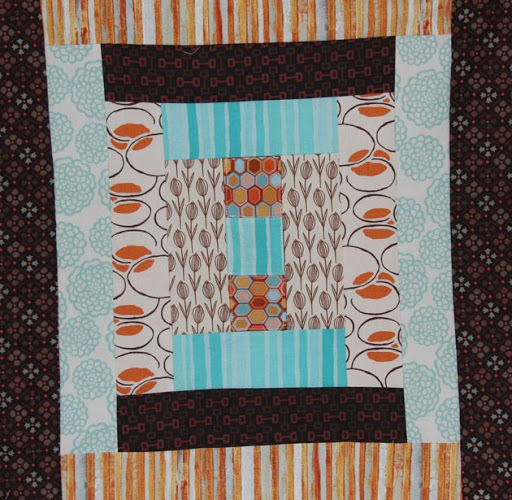 Here’s block 4 of our new bed quilt. I can’t decide if this one or block 1 is my favorite so far. This one is definitely the color scheme I want to stick with for the rest of the blocks. Looking back at block 1, it is as well. 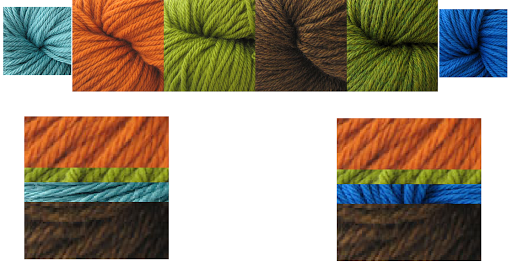 Orange, aqua, brown, and grey with cream and white seems to be the winner. 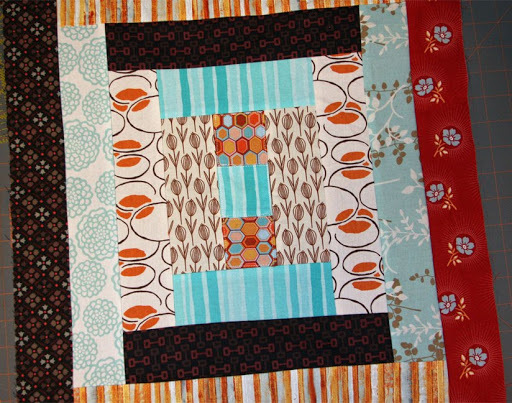 As I get closer to the finish, I’ll decide if I want to keep the two blocks I used some of the red in or if I’ll rip them apart….maybe make pillows with them? Who knows. They’re not terrible by any means, just the red is incongruous with what I’m going for. I guess it will depend on what I have leftover how they look together when I go to piece the top. 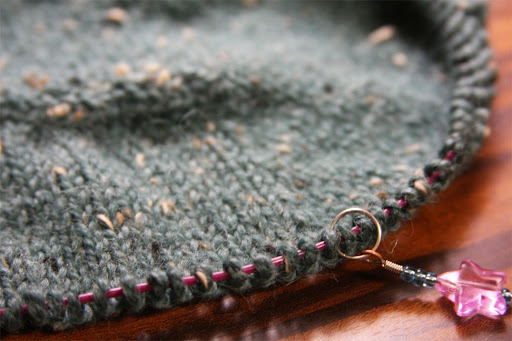 Kittens, you’ve probably already noticed that there isn’t a photo in this week’s WIP post. The answer is quite simple: I’ve had several mis-starts this week. They all ended with frogging. 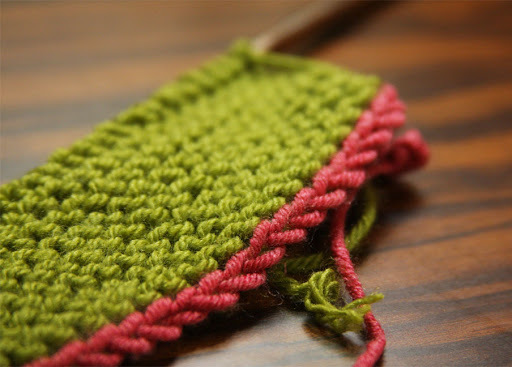 In the wee hours of this morning, I cast on one project and knit…one row. Nothing exciting to look at. Then, I was sent a pattern I’m test knitting, so I’m off to cast that one on. I am working, just have nothing to show for it at the moment.